Due to the spinning precession of the Earth’s axis, the celestial poles move in 25 700 year cycles. The current North Star, Polaris, was the North Star for the previous time. The Polar Star is not very bright. It can be found by connecting the two right-most stars of the Big Dipper by a line, and continuing this line “upwards”. It has been used for orientation within the northern hemisphere since the times of antics. This works, because this star, or the brightest star of the constellation α Ursae Minoris, hardly moves in the sky during the night. It happens to locate close to the north pole of the sky, or close to the extended rotation axis of the Earth, and the rest of the sky appears to rotate around this axis during the night. There is no any corresponding “fixed star” in the southern sky. The direction of the north pole of the sky is determined by the rotation axis of the Earth. Due to the gravitational forces exerted by the Sun and the Moon, this axis wobbles slowly, as does the axis of a fast spinning top toy. Due to this precession phenomenon, the north pole of the sky wanders on a circular track against the background of the stars. One rotation on this track takes 25700 years. Previously, the Polar star was this same polar star at 25 700 years ago. Meanwhile its function has been filled either the Vega of the constellation Lyra, and Deneb, the brightest star of the constellation Swan. Due to the precession, the coordinates for the longitudinal and latitudinal locations on the sky, or the declension and the right ascension, do change with time. 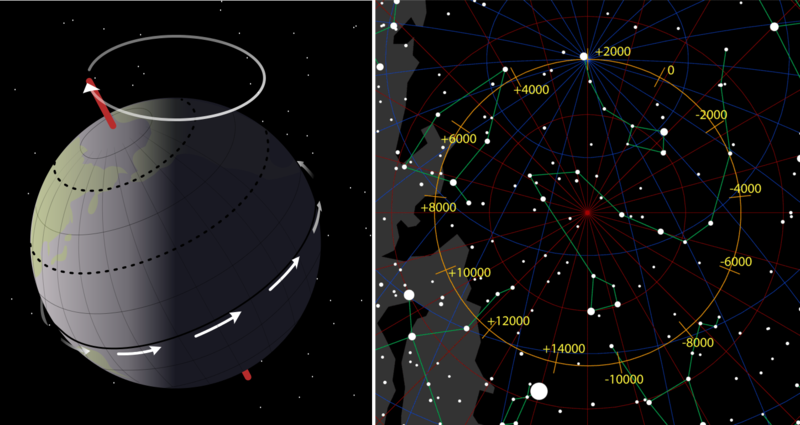 To assistance the location of the stars in the sky, the coordinates have now been fixed to the coordinate positions of the year 2000.